Keep your linked data safe on the internet with NineHertz. With shields of various cybersecurity services, we promise to create hassle-free system protection on worldwide networks. Get your consultation and data security plan now! Is your data is safe on the internet? Do you experience strange changes in your system? If yes, then you’re the victim of cyber attack. Either you connect a device or access any website, your system has a higher chance of getting attacked. So how to get rid of it? The solution for such unwanted malicious activities is to layer up protection on the system. This layer of protection is called Cybersecurity. Cybersecurity, in general, is adding up extra feature, tools and code to the system to protect it and to identify from the various attacks. Some server might have back doors created without prior permission and is accessible by anonymous. One cannot identify easily, as it demands a lot of experience to understand the complete scenario. The increasing of such attack leads us to add cybersecurity as a service in our portfolio. NineHertz provides services which help the user to get rid of such attacks. 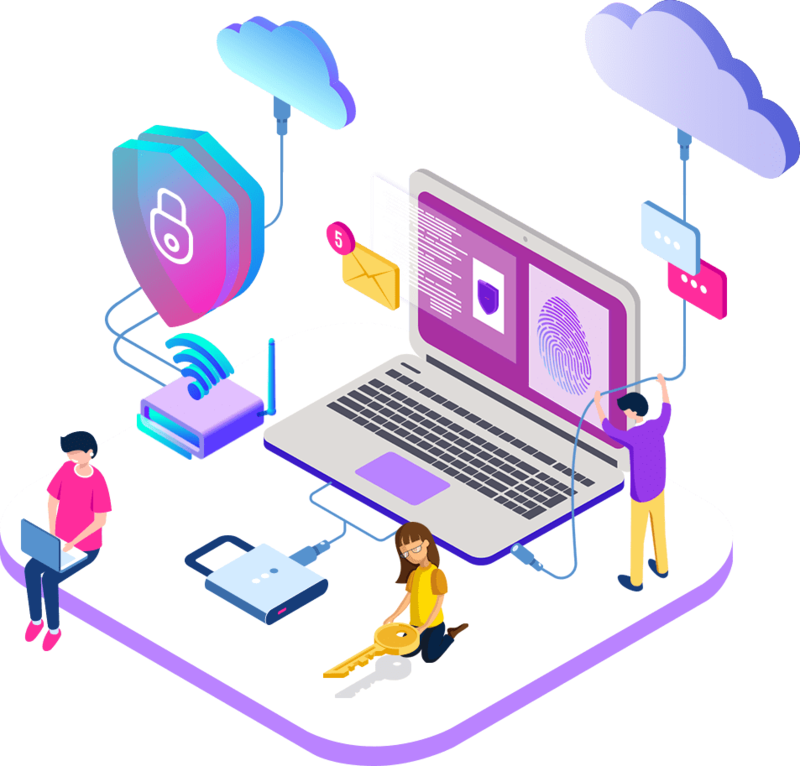 The solution for data security comes in various forms such as a piece of the redemption code, data breaching alerts, adding tools to the system, etc. For existing server/networks, we check the entire composition to find out the loopholes, keeps 24X7 protection from our end, sets up the structure for data protection, vulnerability assessment, forensic investigation, penetration testing, incidence response, etc. We have launched the best cybersecurity services in India and other parts of the world. Enjoy a free consultation with our experienced cybersecurity consultants. Cyber Security warriors of Ninehertz are ready to defend your network at every moment. Discuss your concerns and security plans with our experts and free consultation.Get a cover for your internet-connected devices at budget-friendly cost. Enter the details below and enjoy our services now! We, at NineHertz, has multiple ways to safeguard your system. These security methods have threat-proof panels which keep your system away from viruses and malware. Let’s dig out the reverts on the malicious attacks. Big industries have a lot of data to manage and therefore, it opts for the huge server to keep the record of its resource. With the high server comes the high chance of attacks. Let’s highlight some industries that need special attention to cybersecurity and we provide every security service to them. IT: Computers are the pillar of IT. Every activity in this field is impossible without the servers and networks. These systems store the bulk data in it and take charge to run the entire organisation. IT companies are on the top list who needs cybersecurity. These IT hubs have code file, data of various departments, other confidential data which needs be protected tor each put in the wrong hands. Other industries might few works offline but this sector has a total dependency on networks which increase the danger of various attacks. These firms must have a composition of managed cybersecurity services. NineHertz safeguards the network and server from outside threat, also promise to establish a loop of security. Gone are the days when people used to wait in queue for an appointment, the hospital had to keep piles of files of its patients’ record, employee management register and what not. The modern era has introduced a new way of keeping track of hospital staffers and its patients. Online appointment and schedule dates for operation are easy ways of forming a systematic structure in the healthcare industry. The hospital keeps the data about its patients’ treatment process for the next few years and the same is applicable for the employees working in the hospital. Handling such huge data require server and cloud where data is kept and retrieved when needed. These servers might have chances of injecting any spyware or virus. Any disturbance in the structure by an unidentified person is a threat to the system. To avoid such unwanted activities, we create the rich-feature solution for hospital management department so that the records are kept secure. Everyone seems going cashless nowadays. Use to e-wallet apps by banks, debit and credit cards, net banking, and other online transaction modes has made easier for the user to carry their money in electronic forms. The banks maintain every detail of customer on its server and it is for the customer to keep a check on its account without actually going to the bank. This technology has helped us in a great way, but it came along with online frauds and various other mishappenings during the online transaction. We see many such incidents of online robbery and leaking of bank details. The bank has to maintain its heavy loaded server and cloud to serve its customers in a better way. For that, banks need cybersecurity to protect the online structure of bank with malicious activities. Cybersecurity is important for the banks because every second, one or the other users make the transaction and banks server updates it within a fraction of second. For the server of banks which are running and updating every moment, there’s a crucial need of a strong cybersecurity system. A weak cybersecurity system always leads to data breaching that this may decrease your client list. Cybersecurity is becoming an essential issue for the industrial control system. These systems are operated through a computer system and various other electronic devices. It has lessened the chances of causing blunders as compared with manpower machine. These internet-associate machines have made a revolution in the Industrial Age. Big factories have gigantic machines which are completely computer operated and has an extraordinary productivity ratio. Cybersecurity in these sectors has a high-alert procedure, i.e. every stage is expected to deliver an affirmative outcome. During the processing, if any machine faces halts, then the entire process gets affected. A bit of digital disturbance can lead to chemical explosions, microbiological hazards, the explosion of a power plant, toxicant in the water treatment plant and many more. The cybersecurity came into limelight when the systems were attacked digitally and passwords were stolen at large scale. This interruption of unwanted factors and the discovery of thousands of viruses on the network had led the union to form Cyber Security Rules and Regulation for Industrial control systems. We offer the best cybersecurity tools to shield your devices and machines from any outside threat. After all, everything can be considered, but security has no compromise. Protecting every inch of security to the systems at every stage. We create the immeasurable security strategy which will fight with the attacks and raise your graphs of productivity. Let’s find out the key list of services and solution offering by NineHertz. Works on the general data protection regulation, i.e. follow and abide by the laws and creates an authorised plan for cybersecurity. From the small connecting device to high-volume cloud, we have designed a solution for every venture to face the threats. Analysis of the attacks by following the government policies. Creating attack proof environment for the system. SOCs and CSIRT teams take responsibility for security intelligence. One can trust the network on these two teams as they are master in the cybersecurity. Set a strong structure for your business which has no chance of getting attacked. We help to build an outstanding secured system for your venture. Integration of all-in-one services in the structure. Cybersecurity is a different world where the networks are connected to each other and sharing their connection to fulfil each of its circuits. It safeguards the systems, servers, databases and various other internet connected devices from various kinds of viruses and attacks. It also detects the threat in the system and alerts when attacked. There are multiple ways from which system can be protected, recovering of a virus-injecting system, the system performs an action when it is attacked and many more similar situations. The Managed detection and response services of NineHertz makes you system 100 attack-proof and promises to build an extra strong shield around your credentials. Check out the features at your left and get the services now! Ninehertz creates the safety background for your cloud and servers in mo time. Experience a reliable and easier way to manage security at an affordable budget. We safeguard the online operation against threats on the internet and make relax working atmosphere for you. Overall protection to the user when accessing the Internet. Forms shield around the cloud and improve the security phases.